I was born and have lived in St Albans all my life moving to Jersey Farm 27 years ago. I am married to Sue who runs the office side of the business and have Twins Alex and Rebecca who are at university. I completed a Carpentry apprenticeship in London, upon leaving school. I then worked completing contracts for Martin Grant Homes Ltd on new building works. 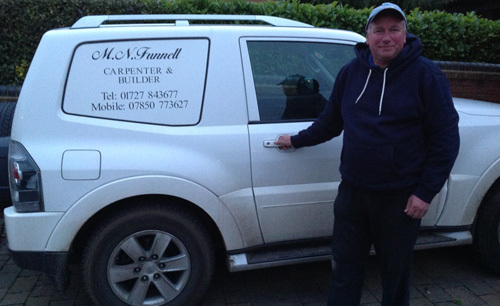 I then formed and established my building company M N Funnell in 1980. I work mainly in St Albans and Harpenden and surrounding area. Most of my work comes from recommendation. I take great pride in my work and always like to build a good working relationship with my customers. I spend a lot of time and effort at the planning stage, making sure that matters like the brick match and roof tile match are as close as possible to the existing so that you cannot tell what is new and what was existing. I will possibly be working in someone’s house for several weeks and like them to feel comfortable with my team working in their surroundings. I am also involved in Jersey Farm Residents Association Committee and Social events and I am on the emergency flood management task force.